This poem is a reminder of what God accomplished for us through the earthly ministry of Jesus, beginning with His birth. He was born for our freedom from sin and Satan. We should never lose sight of that when the billows roll. Lovely poem! Thank you for sharing. Thanks for dropping by, Lureta! You are blessed! Thanks be to God, and His word, and His Holy Spirit...... and for the talent and pleasure that he provides to us children that we might celebrate Him through the arts. Thank you Edith. You are precious. Pinning on Christian poetry board. "The birth of Christ launched God's biggest expression of His love for humanity." I so much love this quote Ma'am. This reminds me of the love of Christ towards his creation... the world. He so much loved us that he had to say "Here I am, send me!" God bless you ma You just reminded me of the love of Christ towards me, so when the billows will roll, I'll recall that there is one who loves me and sees me as the apple of His eyes. Praise the Lord! You are lifted, Ernest! Glory to God and thanks for dropping by, my dear. You are blessed! The birth of Jesus is a display of God's unconditional love to mankind. God is really a loving Father who has bestowed so much love on His children. Indeed, He is! May you personally experience His love in a special way in this season in Jesus' name. WOW! THIS IS SO GOOD. THE BIRTH OF CHIRST HAS REALLY BROUGHT BREAKTHROUGH IN OUR LIVES. GOD HAS SHOWN US MERCY THROUGH HIS BIRTH. I LOVE THIS POEM. IN FACT, EVERY SINGLE WORD VERY SIMPLE, CLEAR AND STRIAGHT TO THE POINT. Praise the Lord. May God grant you a tangible breakthrough in this Christmas season in Jesus' name. this poem is more than a reminder to mankind. just like the word of Isaiah, unto us a son is given. Christ is an opportunity for mankind to better it self, and pray for the grace to overcome sin. The birth of Christ is a new beginning for mankind to better itself and beg for God's mercy to avoid the occasion of sin. Amen. May God decorate your life this Christmas, Nkemdilim, in Jesus' name. For the love God has for mankind, He sent his only son. To me, that's the best gift of Christmas. The birth of Jesus brought salvation and redemption to all. THE BIRTH OF CHRIST IS THE BIRTH OF DELIVERANCE UNTO HUMANKIND. MARANATHA!! Oh come, come Lord Jesus! The birth of Jesus brought light to the world. It brought unconditional love. Master Jesus all glory must forever be yours because you are indeed gracious. that baby Jesus is the best gift given to mankind! Hmm. Recount the victory promised, WHEN THIS BABY WAS BORN.....this has really kept me going. Nice one ma. fact is, when most people go through trials and temptations, they think the Creator have deserted them. first, we should learn to count our blessings and not our losses. before you complain of not having to eat three square meals a day, remember that someone out there cannot even afford a square meal. someone out there cannot even eat because he or she is in the hospital. do not place your focus on the things you don't have yet, be thankful for the ones you have. Christ accomplished a lot for us starting from the day of His birth. Always remember what the joy of His birth brings to humankind. The birth of Christ is a blessing to the world. Thanks for this poem, it is lovely. The coming of Jesus is very significant in the world. his coming has proven to us that God truly loves us and can do anything to redeem mankind. not only did Jesus come to the world, he came as a pauper, suffered death and was crucufied but in his infinite mercy, did all that for the redemption of mankind. May he grant us the ability to love and respect him. Amen Nice peom ma. it's really inspiring. The birth of the child is a sign of love.. God couldn't stand his children perish in this world that he gave his only begotten to come and restore the earth. Remove the birth and we all could av been long gone.. The birth of our Lord Jesus Christ is truly God's greatest blessing and light to humanity.
'' When you’re caught in a tempest'' And nothing seems to help Recount the victory promised When this baby was born This line stuck to my heart. Lovely poem ma, thanks for sharing. Wonderful poem, just refreshed my memory on the story about the birth of Christ. Indeed, the birth of our Saviour, Jesus Christ is a clear demonstration of God's unswerving love for mankind. We can't be happier than this unusual gift from the father. WOW! The birth of Jesus Christ brought so many things for us. What an inspiring poem, encouraging,educating and a reminder to us..Thank you ma. Many a times, Christians when faced with life challenges forget what Christ's birth gave to humanity. Redemption!That is redemption from sin and Satan. Being ignorant of this makes Christians to fall into the ploy of the enemy, hence making His birth irreffective in their lives. "The Father’s love unswerving...To pay for sin through dying..." is a constant reminder that Christ was born to save me from my sins. Thank you! nice, motivating and very interesting poem. has a clean, clear message. The birth of Jesus really showed how God love his creation, his unconditional love for us despite our unfaithfulness. if not for the birth of Christ I wonder what would have become of us. Frankly speaking, even if all our body is mouth it will not be enough to thank him for giving us Jesus Christ because Christ birth brought salvation and redemption of mankind from sin and hardship that follows sin. glory be to God. Thanks ma for this wonderful poem. when this baby was born, a new meaning and purpose was given to man's life and God's perfect plan for mankind was revealed, destroying the evil plans and captivity the devil had over us. The best gift ever is the birth of Jesus Christ. For he is born to set man free from the shackles of sin and death and lift him up to a new life of everlasting glory in Christ JESUS. The most beautiful part of being alive is having a life where Jesus is the primary stakeholder. Beautiful poem. Good morning ma. Its wonderful...so much in so few words! Wow, very inspiring Ma. when I find myself in any tempest, I really do remember the promise made when our savior came. The most interesting part is emphasis on the birth of Jesus Christ, which is a very essential symbol in the poem. We are kept alive by the love God has for us by causing Christ to be born our Saviour; and this must be acknowledged. ...and by his birth, we are hopeful for a blissful life here after. Thanks for this poem ma, it's nice. This isn't just a seasonal poem, but a poem to keep us going when life's situations become unbearable. May I forever remember the promises made, when this baby was born. Beautiful. The birth of Jesus is the greatest gift man will ever receive because his birth brought salvation to all. Indeed, his birth marked the beginning of resounding joy. Short but might poem. A fitting poem for Christmas and the birth of Lord Jesus through whom we are reassured and hopeful. The birth of Christ signify the overcoming of troubles. Christian should remember this whenever the going seems tough. This poem is the recount of the enormous love of God for us for even when challenges are up, i remember this love, if he so love me, why should I fear? the proof of his love is in the birth of christ Jesus. The birth of this baby is the best thing that ever happened to mankind. The birth of Jesus is really a blessing to us...I am really grateful for his existence in my life and he is the cause of my happiness... Nice post mam Edith. i like this, especially how the sentences run on-line i.e enjambment in poetry. The birth Jesus is like giving light to the world. He came to redeem and bring salvation to mankind. A baby that was born not to criticise but give life to all!. The birth of our lord Jesus has redeemed us all! i am extremely conscious of the fact that his birth has brought about good tidings and has promises of a good life devoid of negativities. His birth alone has made the earth rejoice for the victory we have in him! Thank God for his birth he saw the future and knew we would want him. Thank you lord jesus! Thank God for the birth of this wonderful child who was born and didnt know of the cruelty of this world, yet he grew up to accept to shoulder the inquities of the world and die for our sins. Glory to God for his birth cause it was truly needed. The birth of the Messiah brought us peace. Hallelujah! The birth of Christ was brought to save man kind,to save humanity. Without him, I doubt if humans will keep on existing because the Lord our God was willing to raise stones who would praise him, if we humans are not will too. Thanks you Jesus for saving my soul. With a greatful heart. Ive come across several poems, but this particular one really got me. This poem revolves around the birth of Jesus Christ and it is the best thing that ever occurred. The birth of Jesus Christ signalled the era of grace, peace and redemption,but solely to bring salvation to all of mankind . the birth of Jesus Christ is very important to Christians because that is the moment when our Savior was born, this is where his journey to the cross began, the journey to save us all from sin and too help us to everlasting life. The poem is direct and there is the used of repetition for emphasis. Here the joy and the hope of all human began. We found the dead being life as a result of His birth. Thank you ma for presenting this special topic. The poem speaks of how the power and live of human came to restoration. How darkness that cover the earth was overthrown with His birth that comes with light. All human rejoice that our Saviour was born. The birth of Jesus brought Salvation to us. His arrival is a big thing for us for without his birth the humanity would have been doomed.He saved us all when we could not do so. So, Christmas is really a big occasion for Christians. Unto us a Child is born, unto us a Son is given. Unto us salvation is given, away from us doom is taken. God be praised forever! Jesus is our saviour right from the day he was born , he has come to stay with us from the beginning to the end of time. The coming of our Savior is indeed a thing of Joy!May his name be lifted. The birth of Christ is a sign of Gods unconditional love for us. He is an opportunity for mankind to better our lives. The birth of Christ brought us salvation and everlasting peace, which was made possible through the father. i acknowledged the fact that Christ was born to justify me and pay my debt. the birth of Christ is the ultimate celebration because through him mankind was redeemed. The best gift can have is the birth of a child. Children are everything one can ever want or have in this life. The joy of motherhood is crowned is when your child brings you a abundant favors and blessings. The birth of Christ put smiles upon the faces of his parents, brought joy to the world and was the reason why we are alive today. He brought salvation to US!!!!!!! This baby that brought us redemption from our sins. This baby that saved the world. What more gift could we ask for? Thank you Lord for the gift of your son. Thanks for your unconditional love for us. This baby that brought good tidings, this baby that brought life to the lifeless, hope to the hopeless.. hallelujah .. Emmanuel is the best thing that has happened to the world..i feel that if Jesus. Could see this poem, he will be proud of you ma. The most beautiful thing about this poem is that line that speaks of the justification and redemption jesus brought to us after the sins of adam. if jesus had not come down on earth as a baby born unto mary and joseph, what then would have been our faith? what then will be the condition of the world today? jesus' birth is the true testimony of every believer. THANK GOD FOR BABY JESUS WHO MADE OUR RELATIONSHIP WITH GOD TODAY POSSIBLE. PRAISE BE TO HIS HOLY NAME FOR THE VARIOUS SACRIFICE HE HAD TO GO THROUGH ON EARTH JUST TO SAVE ME AND BRING ME TO A DEEPER RELATIONSHIP WITH THE ALMIGHTY. I PRAY THAT HIS BIRTH WILL ALSO REMIND US OF THE INFINITE LOVE AND MERCY OF GOD TO MANKIND. And so the world celebrates over the arrival of a king..baby Jesus ur birth has brought meaning to life its has taken aways sins I bless Gods name for sending the world a wonderful gift. Unto us a child is born, to us a son has come, government shall be upon him wonderful is his name, councillor, almighty God, the everlasting father, prince of peace, the son of God Emmanuel is his..The greatest gift to mankind. The birth of jesus christ i see as the beginning of his sacrifice for us,he came knowing he would die, if humans were put in that position they would decline such task but he took it upon himself,he did not send an angel to die,but he came himself. On a bad day, this should serve as a reminder of God's love and a reason not to give up. We have the fruits of redemption because of the sacrifice of Christ and we are grateful for that. Through Christ we are no longer separated from God and we are now sons of God. Words will not be enough to express our gratitude to God.And we won't stop wondering; if Christ did not come, where will we be? The birth of our Lord Jesus Christ, brought light to the world, peace, love, kindness and so on. Lord Jesus Christ, may all Glory, all honour be unto you forever in Jesus name Amen. The birth of Jesus brought salvation and hope for mankind. 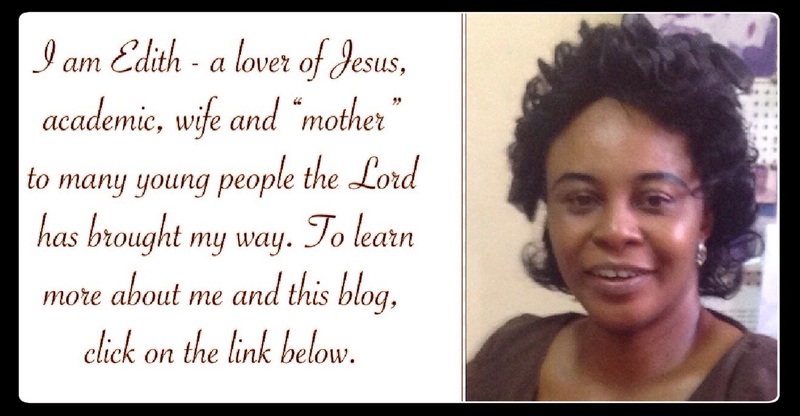 This piece is inspirational and opened my eyes to the beauty of the borth of Jesus. All hail the king Jesus. The redeemer of mankind, him whose blood was shed for my salvation. His birth brought peace, happiness, success. I will forever proclaim your name lord Jesus. Even when all hope is lost, if i remember the gift of God to this world (his son) it stand as a beacon of hope. All hope can never be lost once you have christ in your life. For God so love the world, he sent his only begotten son to come and die for us.... His birth symbolizes peace, joy, hope and abundance. This is such a wonderful poem. Its always comforting to know that God cares for us so much that he sent his only son to come and die for us and for our salvation. Therefore,we should always turn to him in our time of need, trusting that he will always be there for us. Thank you ma for a delightful poem. The birth of Christ gives us a new hope and a new beginning.We Christians should be steadfast so as to partake in his grace and salvation. The greatest gift so far is the gift that God himself gave to mankind by giving his only son for our redemption from sin, having this at the back of our minds,we should endeavour not to crucify Jesus the second time. The birth of Christ brought joy to mankind. I was blessed by the poem. The gift of Jesus Christ was an expensive gift one can ever receive. The birth of Jesus Christ was a sign of a new beginning to the whole world. Therefore, we should endeavor to maintain this priceless gift from God... God bless you ma. When Christ was born, that was the biggest love of God for us, because He brought redemption with Him. There was a plan God had for mankind. Man had been living in sin right from the days in Eden. This baby was born so that these sins which has taken over mankind can be wiped away. What a wonderful poem ma.the repetition of words deployed in the poem is use to create emphasis.His birth was for a reason.To give us hope,joy,peace and enternal life.His birth brought light and deliverance upon humanity.what a great joy and privilege to share from his light. Thanks for reminding us of the unconditional love of God who sent his only begotten son to the world for our sake.... This is what the joy of Christmas is all about. Well composed. The baby was born "to right the wrongs of eden". As from that day, the earth started to know freedom. Freedom for men, freedom for women, freedom​ for all. The baby is all we have. The giver of our life. That day, a day of great joy. From that day his light shine from Bethlehem to all of us. We are all his, for our sake he came. Innocent in his birth and spotless as the father. What else do we lack. Am forever grateful Lord, for your birth has brought unending and unconditional love on mankind,the greatest gift of mankind, the lily of the valley, Emmanuel, elohim. Thank you lord for accepting to save mankind. Thank you ma'am for always upholding and blessing his name! Through one Man (Ada), all was sinned. Through another Man ( Jesus), all was redeemed. Through the birth of Jesus, God displayed his unconditional love to mankind. Big blessings to you ma. The Saviour is born.What a wonderful poem.Thank you for sharing Ma. In Christ we leave and have our being. The source of our salvation. He knows the best time to Glorify his name in our lives, we only need to put ourselves together and wait for his time, his time is always the best. I can't stop appreciating him for his care in my life. I know in his time, an Angel Gabriel will serve us with the good news we've long wished for, just like the one announced to Blessed Virgin Mary his mother. the birth of Jesus Christ laid a foundation for our liberation you, the Bible called him wonderful, counsellor, mighty king whom earth shall worship even nature itself bows before him. His birth is a remembrance of a victory promised by God for our salvation. "For unto us a son is given" mummy God loves me so much that he gave his only son for my salvation in a mortal form to serve as the cleansing of mankind. Jesus was sent to this world for a purpose, to was away our sin, his birth laid a foundation in each and every one lives, we should know that with out him in our lives, we are nothing. The birth of Jesus Christ brought salvation and hope for mankind. This work is inspirational and it reminds me the place of birth and the beauty of our Lord Jesus Christ. All Glory be unto our lord who gave us his son Jesus Christ. The birth of Jesus has brought about a new beginning for all and salvation to the world. Thank God for giving us another chance through his son Jesus Christ. The birth of Christ guaranteed redemption from sin. The birth of Christ made possible, a more personal relationship with God, our creator. The birth of Christ saw to our freedom. Oh when this baby was born! It is because of this baby i am alive, it is because of this baby my sins are forgiven, it is because of this baby i have a future and a hope of seeing heaven. Oh how much i love this baby! There are no words to describe mankind's joy all because of this baby's birth. Your poem really captured the merits of his birth,reminding us that no matter what we may face, he was born for us and is always with us. Unto us a child is born ,unto us a son is given and the God's name shall be upon his shoulder and his name shall be called Emmanuel, wonderful, counselor, so it tells us that when ever we mention God's name that we shall be saved because God the father has given him a name that is the greatest among all other name. Today, we are saved because of God's love for us. He sent his son to the earth- Jesus came to the earth in the form of a man, he performed a lot of miracles on earth and also died so that our sins may be forgiven and our souls will be saved. Jesus is the lamb of God that came to take away the sin of the world. Glory to God! The birth of Christ the saviour of the world ,He was born to save humanity from eternity in hell. Truly, the birth of Christ launched God's biggest expression of His love for humanity. He was born to save the world from sins/correct the wrongs of Eden. His birth was a reminder of God's unconditional love and kindness for us. Let his name be blessed! The birth of Christ launched Gods love for us his children and also it brought light to the world. When I'm caught in a tempest and nothing seems to help. O God may I recount the victory promised when the baby was born. Lovely poem. The birth of Jesus and his taking the form of man marked the begining of our salvation and redemption. "Aallelujah"
The birth of our Lord Jesus Christ brought salvation to our souls. Jesus came into this world in order to die for us and cleanse us from our sins and iniquity. His birth is the beginning for a better mankind and I pray that by his grace we all will be saved. Wonderful poem ma. Thank you Jesus for coming into this world to die for my sins. I'm saved today because of the sacrifice you made on the cross of cavalry for me. Lovely one, ma. This birth truely brought hope to mankind. The birth of Jesus has really brought breakthrough and salvation. The birth of this exceptional being is ideal to humanity. Hence it brought about salvation to man. This a good poem. From the moment I accepted Jesus Christ as my Lord and personal saviour ..I now walk in confidence and face whatever situation with so much faith ..GOD IS GOOD. The only Child that was conceived by the power of the Holy Ghost born through a virgin to save the world. Jesus is the greatest gift of God to mankind. He is God's love made real to humanity and God's righteousness revealed. The birth of Christ has brought grace and unmerited favor to mankind, without this grace I doubt if anyone would still have the gift of life, health etc. Jesus is our saviour. God gave Jesus to us,so we can obtain salvation and grace.his birth was to bring joy to the world. Nice poem. The birth of Jesus is the thing that has happened in the world. fact is, when most people go through trials and temptations, they think the Creator have deserted them. first, we should learn to count our blessings and not our losses. do not place your focus on the things you don't have yet, be thankful for the ones you have. Christ accomplished a lot for us starting from the day of His birth. Always remember what the joy of His birth brings to humankind. What a wonderful poem. I love this poem because it centers on the birth of our lord Jesus Christ who is the saviour and the Redeemer of the world. The birth of Jesus has brought us salvation and joy. It is a good thing that God loves mankind so much that He gave us His only begotten son. Praise the Lord! Hark ! The angels sings , a king of kings is born. The birth of Jesus is the manifestation and display of God's unconditional love to mankind. These imperishable love of God has brought us eternal salvation and joy in Christ Jesus. I really love this poem. Remain blessed ! The birth of baby Jesus is truly the epitome of God's unending love for mankind which is shown in the scripture (John 3:16). This is called the arrival of mankind's salvation. I call him "the truth" and our saviour. Upon all our sinful nature he gave us his begotten son what an amazing LOVE Thank you Jesus. It's a priceless gift from the father Almighty. Allowing his only begotten us to pay for our wickedness with his blood signifies God's unconditional love towards mankind. Christ died so that we may have life and have it abundantly. It's a hope for everyone that believes in him that he is going to spend his eternity in the clouds of heaven. May the Lord be praised both now and forever. He is full of mercy, this is basically the reason why He didn't condemn us back in Eden. I wonder how the world would have been if this baby Jesus wasn't conceived. Who has ever delivered in a kitchen, who has ever delivered in an unconducive environment?. But the Son of God,the saviour of the world in a bid to show his humility, came through poor folks. This post reminds me of the song"Mary did you know"by pentatonix. It gladens my heart to know a precious gift was given to us not just to love us but also save us from our own self. Glory!!! Oh what a wonderful messiah he is his birth brought salvation to us with an aura of peace,love joy and above all redemption to mankind.....this poem is beautiful. Yes and great indeed. A baby whose birth saved many from eternal damnation. A son was really given to us. His work and love for us changed the course of humanity. The birth of Jesus broke unbreakable chains. May He reign forever. What an awesome poem.Ma,your spirituality is genuine and true.when this baby was born,the earth witnessed it,every element, entity witnessed And recognised his power.the angel marvelled and happy of his arrival.we humans should appreciate the king of kings whose birth scared king Herod.every name trembled and marvelled at his birth. God's love for mankind cannot be measured, not just did he come to the world a bodily form which shows humility, he paid the price for our sins and died on the cross of calvary for me and you. which is an incomparable love. The birth of Jesus is really the biggest thing that has ever happened in history. it is also a sign of his unconditional love for mankind. even when He (Jesus) knows that his coming to the world is to suffer, he accepted it with pure heart and came to redeem mankind. God gave me a Christmas gift in the package of His son, Jesus! hallelujah! The birth of Christ brought joy, love and liberation to the world and am so happy Christ died for my sins. The poem reminds us of the birth,ministration and death of Jesus the son of God whom God sent to redeem us from sin.we should never loose hope on him or feel that we are left alone.As God God sent his only begotten son to safe us from evil so therefore, we should acknowledge this goodness and clinge to Jesus the saviour of mankind and believe He will solve our problem. Because of the birth of Jesus Christ we are saved and loved. His birth also salvation to mankind.Therefore,we should depend on God when we are in need. Thank you very much MA for this wonderful poem. When this Baby was born he brought light to brood over our darkness, at that that time he needed an inn to stay but no one would let him, this is because mankind have failed to recognize the light. This baby grew into a man and was led to the cross to die for us, oh! what a sign of love! He asked for water but was given Venigar, we still have failed to recognise True love. May God help mankind, to recognize this light, accept this light, and then shine as light, even in this generation. Thanks ma, this piece is a perfect reminder of God's love for us. 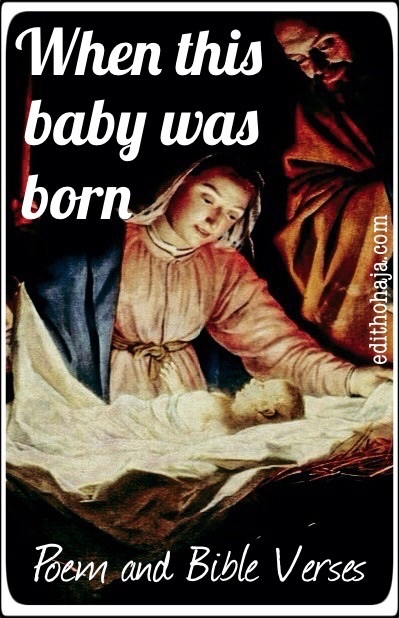 When this baby was born he brought life back to mankind, complete restoration of our hope. Wow glory to God!Thank God for sending the greatest gift of all Jesus to earth. Jesus's birth is one remarkable thing that has happened to mankind . What brings joy to my heart is the fact that Jesus was not just born to heal the sick and cast out demons but he came to die,resurrect and redeem the whole of mankind. Glorrrrry!!!! His name shall be called Emmanuel, Prince of Peace and the Messiah. Jesus was born in a manger to show His humility, He was born to fufill the promise of the Father. The birth of our Lord jesus Christ is indeed a blessing to man kind.. It has given us a great opportunity to be closer to God and go to him without long processes. So as it is he is called our saviour. WHEN THIS BABY WAS BORN signifies the birth of our Lord Jesus Christ, of how when he came into the world, things changed into significant good such as increasing what we call love, abundant blessings, breakthroughs, open doors, lights and end of affliction in the world as well as paying our debts. This poem is a reminder of the salvation of God in our lives, a reminder of the blessing and redemption the birth of Christ brought to the world. The birth of this child really showed us God's love for all creatures on planet earth.The angels showed during his birth that he is reverrred and honoured among all.His birth really changed the world. The birth of our lord Jesus,the saviour of this earth really proved and showed us God's undying love for all humanity on planet earth. The angels revealed his significance, they took him and honored him among all thing. His birth really changed the world and from that time he handed us a lifeline to eternal life. DOES GOD HAVE TO 'BLESS' ME? Or does He have any choice in the matter?